Invisalign is presented as an easy alternative to traditional braces, but getting started isn't as seamless as you might hope. However, this year, my orthodontist recommended an alternative treatment, Invisalign, that had a good chance of straightening my teeth and correcting my bite without surgery. Unlike braces, which use metal wires and brackets to straighten teeth, Invisalign moves teeth with a series of custom-made aligners (aka retainers) made from clear plastic, so they are far less noticeable than braces. I jumped on board right away, but I didn't do as much research as I probably should have. 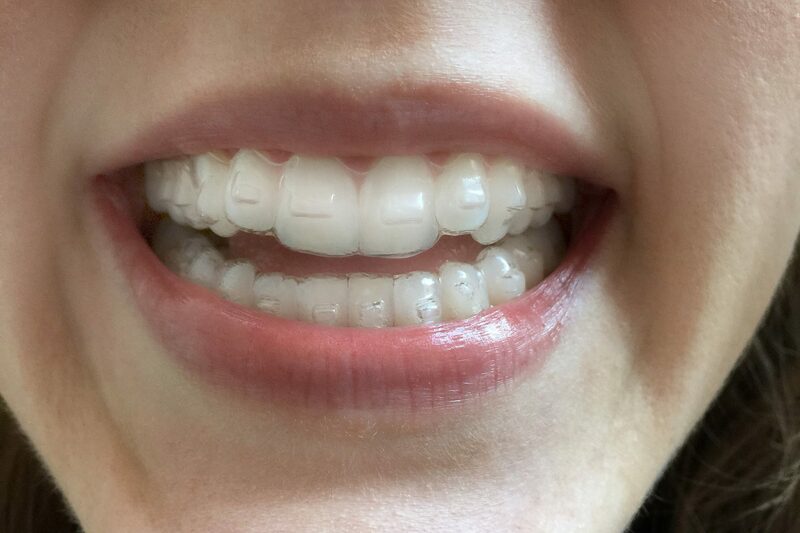 Though I'm only a month into my Invisalign program â€” and am really happy with the results so far! â€” here are some of the things I wish I'd known before I took the plunge. 1. You might receive more attachments than you are expecting. Recent Invisalign procedures may include attachments, or enamel-colored ridges that stick to your teeth like braces brackets. These attachments click into the Invisalign aligners to help the teeth move more effectively. Without the aligners in, the attachment bumps are virtually invisible. But with the aligners in, it looks like you have clear braces. My orthodontist warned me that I would have two attachments, but I ended up with 20. So, most of the day, I look like I'm wearing braces. 2. Recommended wear time is 22 hours. I don't know what I was thinking . . . I guess I figured I could leave the aligners at home when going to a party or out to dinner. But nope. I keep them in unless I'm eating, and I don't leave home without packing an aligner case along with a travel-size toothbrush. 3. You may lose weight. Since the wear time is 22 hours, that leaves two hours to eat three meals a day. It's pretty ambitious, but I do my best to, because it really beats trying to pry the aligners off my teeth more than necessary. The aligners are supertight and especially hard to remove if teeth are sore. While you can always take the aligners out for snacks, I've found it's a pain to remove the aligners and rebrush the teeth more than three times a day. Despite my attempts to pack in the calories at each meal (I'll have a smoothie, omelet, and yogurt for breakfast, etc. ), I still am hungry all the time. I lost a little weight my first month, but I've returned to my normal weight after introducing a protein smoothie to every meal. 4. Kiss lipstick goodbye. Colored lip gloss and lipsticks are a thing of the past. They easily stick to the aligners and the attachments. Clear lip balm and gloss are OK, but they can sometimes leave a waxy residue on the aligners. These days, I'm all about applying dramatic eye makeup to draw attention away from my mouth. 5. No more manicures. The aligners are nearly impossible to remove without the help of your nails, so unless you're OK with chipped nails, stick to buffing your digits over painting them. 6. Kissing is awkward. Yep, there is no avoiding the giant plastic device all up and around your mouth, and it's definitely a mojo quencher. Some people on the Internet claim Invisalign killed their love life, but I think that's a little extreme. It helps to have a significant other who is cool with your retainer mouth. It also helps to try to factor in some of those freebie minutes with your lover. 7. You'll brush your teeth a dozen times a day. All right, maybe more like six, but it feels like a dozen. Plaque and food particles can get in the way of the teeth moving plus can lead to some seriously stanky breath and cavities. As a result, it's best to brush your teeth after eating anything. I use three different types of toothpaste and toothbrushes, since I have to stash them at home, at work, and in my purse. At home,Â I use Nimbus, a supersoft toothbrush, with Tom's of Maine Whole Care Toothpaste. At work, I use more aggressive products to get the teeth superclean and minty: Oral-B Pro-Health All-in-One Toothbrush (it's like a massage chair for your teeth and gums) and Arm & Hammer Advance White Toothpaste. Lastly, for my purse, I have a crummy, generic travel-size toothbrush (it gets the job done) with a travel-size version of Colgate Optic White Toothpaste. I floss with Oral-B Glide. 8. The attachments stain really easily. I have seen it so many times â€” my coffee- and tea-drinking friends who didn't stick to a regimented tooth brushing habit ended up staining their attachments. The practically invisible composite begins to look like orange corn kernel pieces stuck all over their teeth. Yuck! As a result, every cup of coffee or tea must be immediately followed by a teethbrushing. 9. Cold water only. That being said, while wearing Invisalign, you can only drink cold water and maybe some clear sparkling water. Hot tea will stain and warp the aligners. Sugary and alcoholic drinks will lead to plaque buildup. I even attempted to test the waters with a glass of white wine, and it stained the aligners immediately. Darn! 10. Whitening is not an option. Especially if you have attachments in place, whitening is not an option until the Invisalign treatment is complete. However, brushing your teeth often and avoiding stain-causing beverages will perk up your enamel a bit. 11. There's a "refinement period." I thought I'd be done after 40 trays, until my sister said, "Oh no, honey. After that, you'll have a set of refinement aligners to fix any stubborn teeth." So basically, after the initial set of aligners are complete, Invisalign will create another set of refinement aligners to correct any slightly off teeth. Ugh, so my treatment has no foreseeable end in sight. Find Your Next Natural Hair Care Obsession at Target â€” Exclusive!